Greenville Zoo officials have announced that Walter, the zoo’s male giraffe, is among 20 Masai giraffes from across North America that the Giraffe Species Survival Program (SSP) has recommended for transfer to other facilities. While details of the transfer are still being worked out, the Greenville Zoo is preparing for Walter to leave in late March or early April. Join us for a mega-dose of vitamin Z at Zoo Camp 2016! 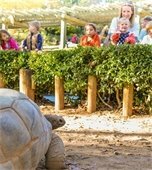 A variety of incredible activities, including animal encounters and zookeeper talks, are in store during these summer camps at the wildest place in town. Spaces are limited and go quickly, so register today! Annual memberships to the Greenville Zoo start at just $42, and a household membership is only $60! Enjoy free or discounted admission to the zoo's education programs, including Zoo Camp, as well as many of the special events, including Boo in the Zoo. Membership benefits also include free or discounted admission to over 130 AZA-accredited zoos across the country. Memberships can be purchased at the zoo or online. Friday, April 1 • 9:00 a.m. – 1:00 p.m.
Join us as we celebrate the great outdoors with activities designed to help children learn about science and nature while playing outside. Saturday, April 2 • 8:00 a.m. – 10:00 a.m.
Greenville's only 5K with a loop through the Greenville Zoo! 5K awards will include annual memberships to the zoo and unique art created by zoo residents. The race will conclude with a brief awards presentation and a family-friendly celebration in Cleveland Park. Saturday, April 2 • 10:00 a.m. – 2:00 p.m.
Enrichment is a process for enhancing the environment and natural behaviors of an animal. We provide our animals with lots of enrichment to keep them healthy and happy, so join us as we celebrate all things enrichment while educators describe the behaviors and activities taking place. Friday, April 8 • 5:30 p.m. – 7:30 p.m.
Join the Greenville Zoo for an evening exclusively for members! This free event features live music by Jacob Johnson, free popcorn and Pepsi products (while supplies last), face painting by Color Me Happy (for the first 50 people in line), costumed character by Once Upon A Dream, and special zookeeper talks. Members will also receive a 20% discount in the zoo gift shop. Don't worry if you're not a member - just purchase or renew your membership BEFORE the event! *Member Appreciation Night is open to Greenville Zoo members only. Zoo guest tickets and reciprocal zoo memberships will not be accepted. Memberships will NOT be sold on the night of the event. Saturday, April 16 • 9:00 a.m. – 1:00 p.m. Celebrate Earth Day with us and learn how you can play a part in making a difference for the future of our planet! Vendors from across the Upstate will be there to educate and share information about conservation. Friday, May 27 • 6:00 p.m. – 9:00 p.m. Tap into the wild at the annual Brew in the Zoo! Adults 21 and older can sample an assortment of beers and enjoy food and live music while exploring the zoo after-hours. All proceeds benefit various programs throughout the zoo. More information coming soon! For even more information, and a behind-the-scenes look at the zoo, check out our video enewsletters! Wild Things: Babies on Board! Introducing the Greenville Zoo App! The Greenville Zoo's new mobile app, GreenvilleZoo, gives users access to the Greenville Zoo anytime, anywhere from their mobile device. Download it to your Android or iPhone today! Copyright 2015 The Greenville Zoo. All Rights Reserved.